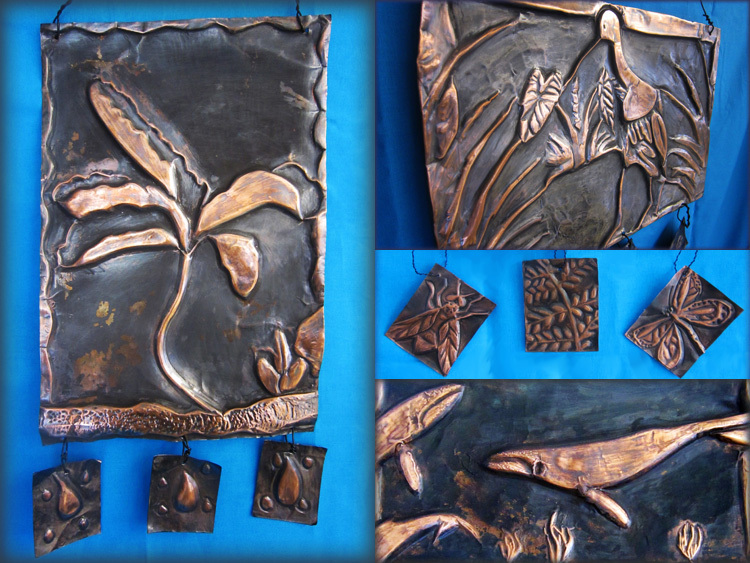 The theme for this low-relief sculptural project was to render one of Hawaii’s threatened or endangered species in 3-D. Students spent time on the U.S. Fish and Wildlife website researching a plant, animal, or sea creature, and learning about the habitat, current population, potential threats, and conservation efforts. After a full investigation of their topic, students worked on preliminary sketches that included elements of the species’ habitat. Final drawings were transferred onto a copper sheet, and then the meticulous process of forming the convexities and concavities followed. The 3-Dimensional quality was created in the soft metal by rubbing both sides with simple tools such as tongue depressors, popsicle sticks, wooden skewers, and the backs of spoons to stretch and bend the surface. The last step was antiquing the final composition with liver of sulphur and polishing with steel wool. Students’ final projects along with typed artist statements were displayed in the main office to inform and educate our school community and spread awareness of the threats Hawaii’s plants and animals face today.